Since it’s launch in 2012, the Mazda CX-5 has been a favourite among sensible SUV drivers, and it has only improved since. Don’t take our word for it though, it is more often than not the top seller amongst SUVs in Australia, and at least in the top ten from month to month. While the medium SUV market keep pumping out new rivals for the CX-5, Mazda seems to be holding its own. Let’s have a look at the details and see why this car makes for a very attractive sale, whether you are on the selling or buying end of the deal. 17-inch alloy wheels, auto headlights, rain sensing wipers, 7 inch Sat Nav screen, USB and Bluetooth, climate control, cruise control, and privacy glass. It has a rear view camera, and a leather steering wheel but no leather seats or full sized spare wheel. The MZD connect is Mazda’s own idrive system and allows the driver keyless start and rotary dial shortcuts that make busy mornings that much smoother. Road noise tends to be loud on highways and rougher roads but sound-cancelling technology has been much improved since the 2015 version. The UX infotainment and 6-speaker system makes for relaxing road trips with the family or a more peaceful journey through traffic and rush hour. The boot measures at 403 L but the middle seats can be folded down to accommodate 1560L. The second row seats have ample room for children and child-seat attachments but also comfortable seat two adults on their own. Option for upgrade to the 2.5 L AWD for $3,000 and another $3,200 for the diesel engine. While the CX-5 has already earned a Five-star ANCAP rating, $1,230 will give drivers a safety package that truly rivals those of competitors. The pack includes rear-cross traffic alert (incredible for backing out onto busy streets), blind-sport monitoring, auto dimming rear view mirror, and low-speed autonomous braking. It isn’t a self driving car but it sure makes the road a safer place, especially for those with little ones in the back seat. Speaking of children and longer car trips, ISOFIX anchors on the outward pews makes for worry-free car seat mounting, although the CX-5 it is lacking in rear air vents and USB inserts. 2.0 Litre Skyactive engine similar to the ever-popular Mazda3 and makes 114 kW at 6000rpm. The light 1491kgs means we get a little more than the less than punchy engine might otherwise give. There is a $3,000 option to upgrade to the 2.5 Litre All-Wheel-Drive Maxx Sport which makes 138Kw and 250 Nm petrol engine. There is also an option for diesel engine for an additional $3,200. Any way you decide you’ll enjoy the elegant 6-speed auto gear box featuring and enjoyably zippy sports mode. The 6.4L per 100km that is quoted would make it one of the best in it’s class, and some testers have managed to hit under 7L in their trials, still more economical than the direct competitors. 3 years, unlimited kilometres plus $68-84 in roadside assistance options. Toyota RAV-4, Subaru Forester, Kia Sportage, Ford Kuga, Hyundai Tuscon. 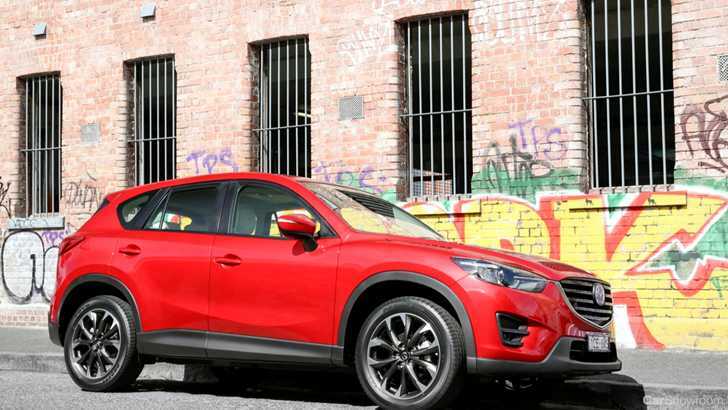 Mazda has enjoyed sitting comfortably at the top of the medium SUVs for decades but new flashy models from the competition are pushing the company to work a little harder for it’s ranking. For now, the CX-5 still beats out the others, but with less of a margin than it once enjoyed. Cons: The FWD is sufficient for around town but lacks punchiness of the AWD 2.5 L option. Recommendation: Go for both the AWD upgrade and the awesome safety package for the most rewarding buy!